American Airlines is not thrilled about Qatar Airways' desire to acquire a 10% stake in the U.S. airline. CEO Doug Parker sent a letter to American Airlines employees after news hit Thursday that Qatar Airways wants to buy at least $808 million worth of stock in American (AAL), the world's largest airline. In the letter, Parker said American executives "aren't particularly excited" about Qatar's interest in acquiring a big stake in the company, but admitted that there's nothing they can do about it. "We cannot control who sells or purchases" our stock, Parker said. American and other airlines, including Delta (DAL) and United (UAL), have accused state-run Qatar Airways -- along with United Arab Emirates airlines Emirates and Etihad -- of getting unfair financial backing from their respective governments. They claim that violates existing aviation agreements with the U.S. known as Open Skies. The U.S. carriers say those subsidies have allowed the Gulf airlines to rapidly expand in the U.S., giving them an unfair advantage and hurting jobs. The Gulf airlines deny those claims. The U.S. airlines are pressing President Trump's administration to review the Open Skies agreements that give Gulf carriers the unfettered ability to fly to American destinations and across U.S. airspace. The agreements extend reciprocal access to U.S. carriers. Parker said in his letter that American Airlines "will not be discouraged or dissuaded from our full court press in Washington, D.C., to stand up to companies that are illegally subsidized by their governments." "If anything, this development strengthens our resolve to ensure the U.S. government enforces its trade agreements regarding fair competition with Gulf carriers," Parker wrote. Parker also told employees there's a limit to how many American Airlines shares -- and thus how much influence -- Qatar Airways can hold. Under federal law, a foreign entity cannot own more than 25% of a U.S. airline, he wrote. American Airlines shares climbed 3% after reports of the unsolicited approach from Qatar Airways. Qatar Airways did not immediately respond to a request for comment about Parker's letter. The move by Qatar could be part of an effort to expand its investments in other members of the OneWorld alliance. 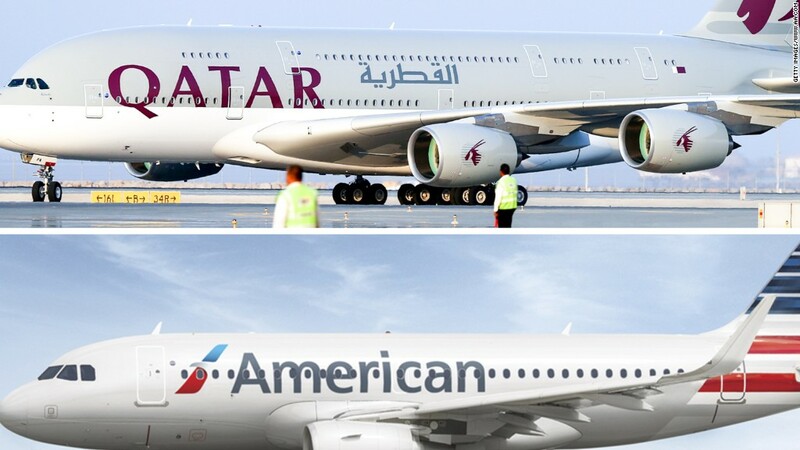 Both Qatar Airways and American Airlines are members of the group -- which promotes coordination among its members to ease travel pains for international fliers. Managing director at aviation consultancy firm Aerotask, Rob Watts, said Qatar's investment in American could serve to help block increased coordination between American and other Gulf carriers. Qatar already owns stakes in International Consolidated Airlines Group (BABWF) (parent of British Airways and Spain's Iberia), and LATAM Airlines (LTM). Qatar is one of the richest county in the world, per capita. Its state-run airway has been under economic pressure as its neighbors have sought to implement an embargo against the country over a political dispute. Qatar Airways can no longer fly to more than a dozen locations in Saudi Arabia, the UAE and Bahrain. An estimated 50 flights per day have been grounded. The State Department this week criticized the move, saying Qatar's rivals have yet to detail proof that the small nation is a state sponsor of terrorism. Qatar has denied the accusation. --CNNMoney's Zahraa Alkhalisi contributed to this report. Correction: An earlier version of this article incorrectly described the rules about foreign ownership of airlines.